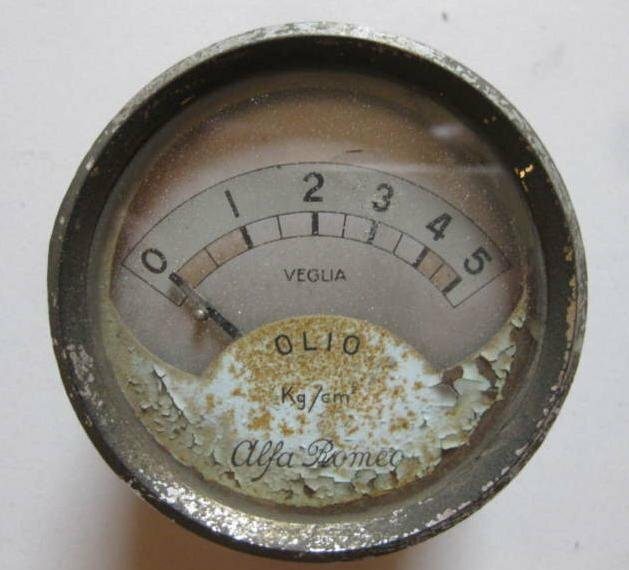 Alfa Romeo Bulletin Board & Forums > Alfa Romeo Production Models Forums > Limited Production (1910-1949) > Old clock for vintage car or bus? Orologio A lfa? Old clock for vintage car or bus? Orologio A lfa? Would somebody have any suggestions about the type of car or bus that used this vintage periode Alfa clock standardwise? Or was it maybe an accessoire offered by Alfa on some of their vehicles? diameter 8 cm, thickness 3 cm, lenght of the cable 13 cm. Thanks for any kind (of) help. There was an oil gauge shown in this thread that seems to be in the same style and therefore probably from the same period. My best guess is that, due to the Art Deco look and the fact that 6C 1500, 1750 and 1900 and 8C 2300 models were fitted with a clock on the dashboard, that this clock may be from the early 1930s. However, the pictures I've seen of instruments used in these models indicate that they typically had a black face with white lettering and white hands, and that the clocks used Roman numerals. So, what these instruments and the clock was used for remains (at least for me) a mystery. I don't see where the electrical connections are.. nor how it is fastened to a surface.. Is the stem for resetting it or is it dual purpose to wind it like a watch also? It is possible the 8 in the diamond means it is an 8 day clock which we used in the USAF on aircraft and were wound like a watch. I don't know why 8 was such a magic number but it was the way they were. The crescent slot might be to set the timing fast or slow to adjust which works on the main spring if it s a wind-up type just like old fashioned alarm locks. A good clocksmith would be able to sort out that question in a glance. Last edited by divotandtralee; 04-06-2019 at 10:14 AM. The black clocks you mentioned, are they also marked Alfa Romeo? I have seen some black Jaeger clocks on the 6C 1750 cars on the Net. The back plate of the oil pressure gauge you’re showing has resemblance with the clock indeed. Was it of the fifties? There is no electric involved here like you suggested and the cabel has 2 tasks: winding up and time setting. The clock will definitely need a clocksmith as it doesn’t work at all. Thanks for your replies, the question of the correct car remains like Tubut says. 8 days allows you to wind it once a week … with some little room for being late? I am guessing the example here came from a truck or bus. Hi John, I was also thinking in that 'bus or truck' direction. Could the numbering on the back of the clock be an Alfa number? ...chassis number? It says 716974 or 717974. The 6 and the 7 have been stamped one over the other. Maybe it is only a Veglia number?